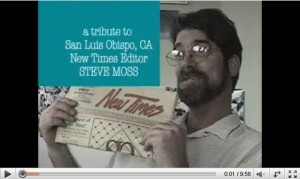 Steve Moss was the editor, publisher, and founder of New Times. He also created the 55 Fiction short story contest, which developed an international literary following. Moss died in 2005, but his legacy lives on. We miss you, Steve. Enjoy. Newtimes: Steve Moss New times and old times. It was really great to have a publication as The New Times when Steve was at the helm. Like most publications today there is no real in depth investigative journalism. You could always pick up a copy of The New Times and read stories you couldn’t find elsewhere. Steve wasn’t afraid to have printed what others wouldn’t, like it or not. There in lays the rub. This was after I had asked him how the station was going to handle a citation I received from a police officer for disobeying an order to exit at roadblock while denying me access to a fatal traffic accident on Cuesta Grade, further saying, you get a speeding ticket, it’s you’re problem. With that i agreed, but I was there at the stations direction. So it is in today’s world of news gathering. We could sure use more people like Steve Moss, and even Ben Reddick, Publisher of the former daily press in Paso Robles. Didn’t have u- tube in those day’s when Gentle Ben was around, would have been nice to hear what Mr. Reddick’s take on journalism would be for today’s generation. We miss you both, sorry this generation is missing out as well.